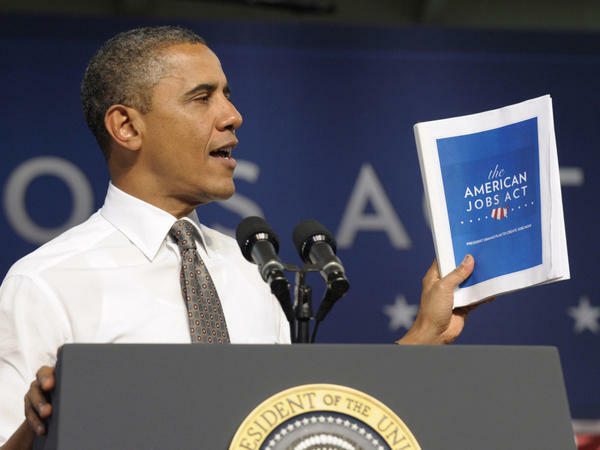 President Obama holds up a copy of his jobs bill as he speaks at Eastfield College in Mesquite, Texas. Obama is challenging a divided Congress to unite behind the bill or get ready to be run "out of town" by angry voters. It's been nearly two weeks since President Obama urged a crowd of supporters in Denver to turn up the heat on lawmakers in Washington to pass his $447 billion jobs bill. So far on Capitol Hill, it's gone nowhere. That could change Tuesday when the Senate holds a vote on taking up the legislation. But fierce Republican opposition both to the bill and how it's paid for leaves slim prospects of it going any further. For weeks, Obama could not get even the Democrats in charge of the Senate to take up the bill. Some of them had big problems with his plan to pay for it with tax hikes on households making more than $250,000 a year. So last week, New York Democrat Charles Schumer offered an alternative plan that significantly raised that income threshold. Schumer's plan imposes a 5.6 percent surcharge only on those whose incomes are above $1 million. "In other words, 99 percent plus of American people will not have their taxes raised, nor should they," Schumer said. The decision to hit income only above $1 million with a surcharge was a sharp break with a firmly held Democratic belief: namely, that families making above $250,000 should pay higher taxes. But as Senate Majority Leader Harry Reid pointed out, two recent nationwide polls have shown 3 out of 4 Americans believe it is fair to tax millionaires more. "Wealthy Americans agree. Two-thirds of people making more than $1 million a year said they would gladly contribute more," Sen. Reid said. "A supermajority of Republicans agree, with two-thirds saying they supported the idea." But that majority doesn't include Senate Republicans. On Thursday, their leader, Mitch McConnell, accused Senate Democrats of making the jobs bill even more partisan with the surcharge on millionaires. "The president has said it's wrong to raise taxes in this weak economic environment. If he meant what he said, surely he'll join me in opposing this unwise tax hike Senate Democrats have proposed," McConnell said. At a White House news conference 90 minutes later, President Obama gave a thumbs up to the Democrats' plan of boosting taxes on income beyond $1 million, saying it was an approach he was comfortable with. The president stuck to that populist stance in his weekly video address over the weekend: The wealthy, he said, do owe more to the rest of society. "Some see this as class warfare. I see it as a simple choice," Obama said. "We can either keep taxes exactly as they are for millionaires and billionaires, or we can ask them to pay at least the same rate as a plumber or a bus driver." On a lawn outside the House of Representatives last week, several hundred demonstrators, many in shirts with union logos, demanded that the GOP-led House take up the president's jobs bill and pass it. A couple of days earlier, House Majority Leader Eric Cantor had already declared it dead. "The president continues to say, 'Pass my bill, in its entirety,' and as I've said from the outset, the all-or-nothing approach is just unacceptable," Cantor said. But in the Senate, it appears the new millionaires surcharge has prompted some doubting Democrats to get on board with the jobs bill, including Louisiana's Mary Landrieu. "I think this small increase in income tax for families that make over $1 dollars is a better approach than taking away tax incentives for domestic oil and gas companies," she said. Not a single Senate Republican has come out in favor of the jobs bill, meaning it should be easy to filibuster. Even some Democrats remain opposed, like Nebraska's Ben Nelson. "I think we need to cut spending in this town and not raise taxes," he said. Still, most Democrats feel hiking taxes on the wealthy is a winning issue, if not for passing the jobs bill, perhaps for next year's elections. It's MORNING EDITION from NPR News. Good morning, I'm Renee Montagne. There's a good chance the Senate will take up President Obama's jobs bill this week. In speeches around the country, the president has been urging supporter to put pressure on Congress to act. PRESIDENT BARACK OBAMA: Tell them the time for action is now. Tell them you want to create jobs now. Tell them to pass the bill. INSKEEP: Senators may agree that the time to consider action is now. MONTAGNE: But you notice, we said the Senate will take up the bill, not necessarily pass it or approve anything the House would pass. Republican opposition hurts the bill's chances of going forward. INSKEEP: And so do questions about where to find $447 billion to pay for the plan. DAVID WELNA, BYLINE: For weeks, President Obama could not get even the Democrats in charge of the Senate to take up his jobs bill. Some of them had big problems with his plan to pay for it with tax hikes on households making more than a quarter million dollars a year. So last week, New York Democrat Charles Schumer offered an alternative plan that significantly raised that income threshold. SENATOR CHARLES SCHUMER: It imposes a 5.6 percent surcharge only on those whose incomes are above a million dollars. In other words, 99 percent-plus of American people will not have their taxes raised, nor should they. WELNA: The decision to hit income only above a million dollars with a surcharge was a sharp break with a firmly-held Democratic belief; namely, that families making above a quarter million dollars should pay higher taxes. But as Senate majority leader Harry Reid points out, two recent nationwide polls have shown three-out-of-four Americans believe it is fair to tax millionaires more. SENATOR HARRY REID: Wealthy Americans agree. Two-thirds of people making more than a million dollars a year said they would gladly contribute more. A supermajority of Republicans agree, with two-thirds saying they supported the idea. An even majority, 52 percent of the Tea Party members agree. WELNA: But not Senate Republicans. On Thursday, their leader, Mitch McConnell, accused Senate Democrats of making the jobs bill even more partisan with the millionaires' surcharge. SENATOR MITCH MCCONNELL: The president has said it's wrong to raise taxes in this weak economic environment. If he meant what he said, surely he'll join me in opposing this unwise tax hike Senate Democrats have proposed. WELNA: At a White House news conference 90 minutes later, President Obama gave a thumbs-up to the Democrats' plan of boosting taxes on income beyond a million dollars. OBAMA: The approach that the Senate is taking, I'm comfortable with. WELNA: The president stuck to that populist stance in his weekly video address over the weekend. The wealthy, he said, do owe more to the rest of society. OBAMA: Some see this as class warfare. I see it as a simple choice. We can either keep taxes exactly as they are for millionaires and billionaires, or we can ask them to pay at least the same rate as a plumber or a bus driver. WELNA: On a lawn outside the House of Representatives, a couple hundred demonstrators, many in shirts with union logos, demanded, last week, that the GOP-led House take up the president's jobs bill and pass it. A couple of days earlier, House majority leader Eric Cantor had already declared it dead. REPRESENTATIVE ERIC CANTOR: The president continues to say, pass my bill in its entirety. And as I've said from the outset, the all or nothing approach is just unacceptable. WELNA: But in the Senate, it appears the new millionaires surcharge has prompted some doubting Democrats to get on board with the jobs bill, including Louisiana's Mary Landrieu. SENATOR MARY LANDRIEU: I think this, you know, small increase in income tax for families that make over a million dollars is a better approach than taking away tax incentives for domestic oil and gas companies. WELNA: Not a single Senate Republican has come out in favor of the jobs bill, meaning it should be easy to filibuster. Even some Democrats remain opposed - one of them is Nebraska's Ben Nelson. SENATOR BEN NELSON: I think we need to cut spending in this town and not raise taxes. WELNA: Still, most Democrats feel hiking taxes on the wealthy is a winning issue, if not for passing the jobs bill, perhaps for next year's elections. David Welna, NPR News, the Capitol. Transcript provided by NPR, Copyright NPR.